A beautiful bike that is perfect for someone looking for a slightly bigger model than your typical folding bike. Quick, agile and able to conquer any type of terrain. 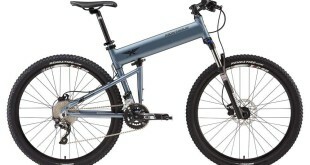 The Montague Paratrooper Pro folding bike is a truly sturdy piece of kit. The bike was orginally designed for paratroopers so that they could land, quickly unfold the bike and then mount it to travel across various types of terrain extremely rapidly. The bike is now used by civilians around streets and all types of other terrain across the world. It weighs very little, folds in less than 30 seconds and is capable of traversing both hills and flats at extremely high speeds. There really is little that this bike can’t do. Built for a paratrooper, that shows just how sturdy this piece of kit is. The Paratrooper Pro is a well built bike that is more than capable of performing exceptionally well through any type of terrain, brilliant! The bike genuinely does excel across the city streets, it is such a comfortable ride too, something that can’t be said about all folding bikes that are currently available. We tested this bike both in an urban environment and also during a 10 mile bike ride throughout the countryside. What is the best folding bike? Currently the Montague Paratrooper Pro is rank #5 in our detailed list of all the Best Folding Bike Reviews. While traversing the city it flew down the streets faster than a typical 20″ folding bike, hills were extremely easy to climb – largely due to the 27 different gears that the Montague Paratrooper Pro possesses. However, it truly exceled when we reached the countryside. I was going over grass, rocky footpaths, flying through ditches like they weren’t there and easily passing through puddles and mud. The grip on these large tyres is quite surprising really, at no point did I feel like I was at any sort of risk of falling off, despite truly pushing the bike to its limits. The disc brakes are absolutely fantastic too, and a real talking points, they are very sharp when you need them to be, but can be applied gently too. This folding bike really has been made with perfection in mind, I caught myself trying to fault the bike and I really couldn’t come up with much at all. My one criticism is an obvious one, due to the size of the bikes wheels and the 20″ frame, it is quite bulky. So clearly carrying it around all day can be a bit of a pain, however if this is not an issue for you, there are so many benefits that can be derived from it over and above its smaller counterparts. It is much faster, more sturdy, more comfortable and above all, generally a more refined bike. When it comes to folding the bike away, it took us a mere 25-30 seconds to get it completely put away, not too bad – but then again, not quite as hastily as the smaller bikes on the market. I believe the Montague Paratrooper Pro is a truly brilliant folding bike, and while it may not be for everyone due to its large size, for those who want a bigger bike – it is a fantastic option that really cannot be ignored. It is not too expensive either for such a high quality bike, $995 is a fantastic price. Moderately more expensive than the average folding bike, but still extremely affordable for all the benefits it brings along.